The thump and roll of machines. Tracks through hills of the Thames with miners tents visible. The Gemini leaves with Commissioner Mackay and Te Moananui for Matariki, Manaia, where there is to be a large meeting of Maori regarding opening up more of Coromandel for gold mining. Mr Mackay has alluded to this in recent speeches but an earlier planned meeting could not take place as all Te Moananui’s people could not be assembled and with Moananui coming to the Thames the korero was postponed. Superintendent Williamson has been living at the house of Mr Eyre, the government surveyor, at the Thames. All the party have been more or less attacked with diahorrea. Major Heaphy has been ill with dysentery. The leader in the Shotover reef has run out but in exchange they have found one of even greater richness. This new run of reef is opened this morning. Mr Mackay instructs the government surveyor to reserve the ground between the Moanataiari creek and the point towards Kuranui for the erection of machinery. Mr Goodall has selected a position on the ground and will have his plant here this week. 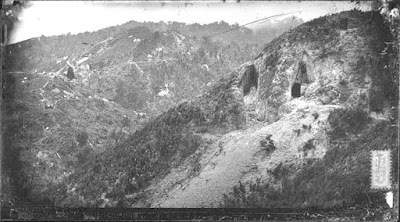 Mr Fraser’s machinery is on the Kuranui and when Hamilton and party have agreed to permit a tramway to be constructed over their claim to enable the parties working beyond to convey their quartz to the engine, it will be in operation. The claims now worked will give employment to 30. The Berdan’s and dolly crushers are in operation. There is also a Berdan worked in the yard behind the Shortland Hotel. The men bring their quartz in small quantities to be tested and from day break until dark there is a continual thump, thump and rolling of the machine. There are around 1,000 men prospecting and looking for work. Many now have their families at the Thames. Blacksmiths, carpenters and shoemakers are doing well. There is a class of men trying their chances who are unfit to work on the ranges, many of whom were they to strike a leader, would not know how to follow it. The Tauranga arrives at the Thames but she brings no Auckland papers. The supposition is that all the newspaper compositors have taken themselves off to the diggings. Clarissa Anne for the Thames with 400 cwt flour, one box sundries. Susan for the Thames with a cargo of bricks and lime and other building materials. Catherine for the Thames with bricks and timber. The arrival of the ss Claud Hamilton is anxiously looked for as she is bringing a return on the value of the Thames gold from the Sydney mint. Things are dull at Wangarei (Whangarei) where work is scarce, no is money stirring and business is very low. It is hoped the Thames diggings will improve matters - a great many have left for there already. Superintendent Williamson is still at the Thames. The Gemini has not returned from Manaia. Of the men attracted to the Thames in the hope of bettering themselves many have gone taking all the ready money they can raise, some of their savings if they have any, others by selling household effects or any articles that they can best afford to do without. A great number have left wives and children in Auckland, and a considerable proportion of these families are being maintained in their absence by credit at the bakers and retailers who supply them in the hope of “luck turning up at the diggings”, when they make certain of being repaid. Unless very rich surface diggings are discovered at the Thames, it is thought the majority of men will be disappointed and the Auckland traders will be unpaid. If the goldfield had attracted men with money, the result would have been different, but it has simply diverted surplus capital labour to an enterprise which has yielded no equivalent result. A storekeeper at the Thames says he does not think any of his class is making more than tucker, but is existing, like most of the diggers, on hope. It is distressing to see loafers who stand about on corners, waiting for rushes. Richard Matthews is at the Thames staying with two experienced Australian diggers in their camp about three quarters of a mile from the back of the township. Their tent is close to the banks of a fresh water stream. He believes that to get a true feel for the progress of the diggings the best way is to join a working party and remain with them, which he is doing. He visits almost every claim and after a minute investigation comes to the conclusion that there is not a payable goldfield at the Thames. There are only four to six good claims being worked. He is doubtful that a ‘reef’ in the full meaning of the term has actually been discovered. As for alluvial gold, there is none. It is remarkable that anyone could have suspected its existence in the Karaka Flat, looking at the surrounding aspect of the country. Matthews thinks such a person must possess a very strong imagination and very little common sense, to say nothing of a total want of geological knowledge. Every portion of the ranges has been well examined by the diggers. You can scarcely go over 50 feet without finding the surface scratched, in some cases to a considerable depth. An immense amount of labour must have been expended. In the most unlikely places, near the summit of peaks double the height of Mount Eden, there are drives piercing the solid rock for several yards. Down the sides of the gullies and along the margin of the streams it is evident that days and even weeks of persevering labour has been applied by the indefatigable miners before they gave up. There are no gold agency offices in Shortland Town. The precious metal is not exhibited in any of the shop windows. It doesn’t seem to be a goldfields town at all. It is a busy little town for the transaction of ordinary business. The public houses are usually thronged —in fact, it is a common saying that they are the only payable reefs in the district. The grocery stores are doing pretty well but they are in the habit of giving large credit to persons who assume to possess a ‘payable reef’ and who have a specimen or two to show — a very dangerous practice. Land speculators, however, have done well. Business sites have exchanged hands at a most enormous profit. There is a good deal of ‘gambling’ going on in the way of purchasing and selling shares in assumed gold bearing quartz reefs. Many have made nice little sums by this practice, others have lost by it. Richard Matthews observes that there are now nearly 3,000 Europeans at the Thames. The way things are there is not permanent employment for more than 600 miners. Unless more country is thrown open, or something extraordinary happens he thinks a dreadful state of things will ensue in this overcrowded small district. Hundreds of hardworking men are unable, after the most determined labour, either to find a payable reef, or to get employed as labourers. Many would return to Auckland if they could raise the five shillings to do so. A further rush must be discouraged. A fearful responsibility may yet rest upon those who have been instrumental in causing large bodies of men to break up their homes and leave their occupations in Auckland, by the publication, either privately or in print, of grossly exaggerated and over coloured pictures of what can be done at the gold diggings. Men must live and Matthews would not be surprised to hear in future of cases of ‘sticking up’ and other violence being perpetrated at the Thames. Rob Roy for the Thames with 2 tons flour, 4 hhds beer, 6 cases ale, 2 garden hoes, 5 cases wine and spirits, 10 gallons spirits, 4 cases brandy, 4 cases biscuit, 2 boxes candles, 3 horses, 3 drays, 2 passengers. Three cheers for Queen Victoria. The Gemini arrives back from Manaia but without Mr Mackay or Te Moananui. Moananui’s people are busy at their cultivations and the korero with respect to opening up the Coromandel country could not take place. There is speculation at Shortland Town as to whether the Superintendent will persist with seeing Te Hira to open up the Upper Thames. Ropata is a chief of considerable authority and he has sent his boat to announce to his people the coming of Superintendent Williamson into their neighbourhood. The Superintendent wants to bring a large amount of Maori influence to bear as possible. Doady to the Thames with 6,000 ft timber, 10,000 shingles, 2 doors, 2 windlasses, 3 casks beer. The Tauranga, returning from the Thames tonight, passes a large raft of timber adrift in the harbour. There is marked growth in Shortland Town. A fortnight ago there were not 20 wooden structures – now there are upwards of 50. An iron structure of considerable dimensions has been erected; it will be known as the British and used as a music hall. It will be kept by Mr Boulter. The Reverend Mr Hill arrives at the Thames this morning. There is public worship held in the township every Sunday by various denominations. The Gemini is running short of coals and Captain Casey goes back up to Auckland to organise a fresh supply, which will come down on the Enterprise on Monday. Captain Eyre takes over the Gemini. There are rumours that the Enterprise will discontinue running to the Thames, and will be engaged in conveying the passengers for the Midge and Tauranga up the river, the Enterprise being the only steamer at present capable of entering the Kauaeranga River. Messrs Holmes Bros state that no such arrangement has been made, and the Enterprise will continue to convey passengers to the Thames from Auckland. Severn to the Thames with 8,000ft timber, 6 tons oilmen’s stores, 6 passengers, 12lbs blasting powder. Willie Winkie to the Thames with 3 tons coals. 1 ½ tons flour, 5 bags sugar, 8 boxes tea, 1 bag maize, 2 dozen rum, 1 load timber, ½ ton potatoes, 29 axes, 5 boxes, 1 package. During the past week there has not been so large a rush to the Thames as that which preceded it. The surplus population of Auckland had been pretty well cleared out. As the Enterprise leaves the Thames for Auckland it passes the cutters Diamond, Alarm, Kate, Harriet, Emma, Sydney and Pearl all lying at Kauaeranga. The Gemini leaves the Kauaeranga. Precisely at 5pm she enters the Thames (Waihou) river. 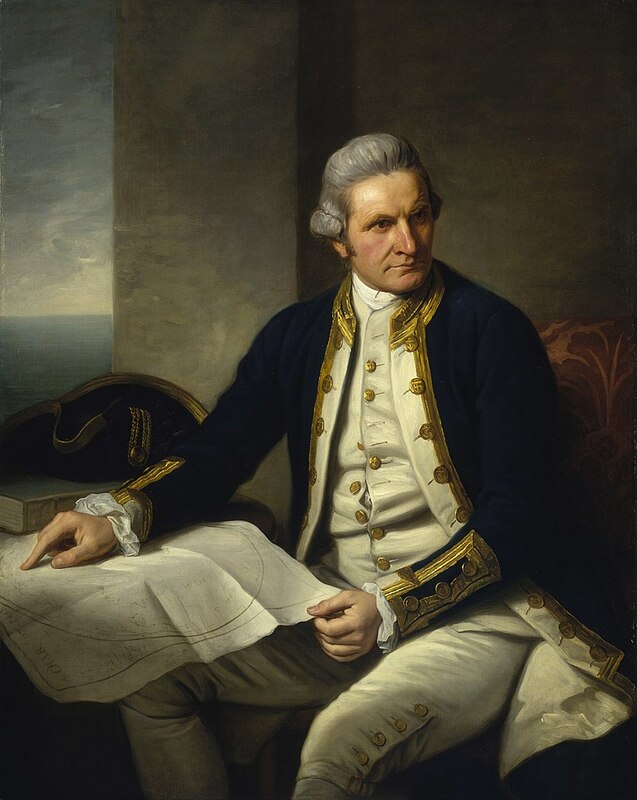 Captain James Cook first sighted New Zealand in October and today significantly is the birthday of the great navigator*. 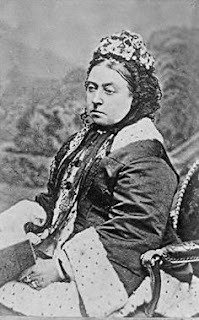 Superintendent Williamson proposes that, on this great occasion of the first steamer entering the Thames river, three cheers should be given for Queen Victoria. Cheers are then given for Ropata and the Maori inhabitants of the river. They steam past the site of the famous Totara Pa, where people of the district were slaughtered by the dreaded Hongi Hika in 1821. The Europeans on board the Gemini think this would be a splendid river were it not for the shallowness of water at the entrance, which makes it impossible for larger vessels to enter. They soon arrive at their destination, Kopu, where at the old flax mill they disembark and are kindly received by Mr McGregor. The Gemini is to return to Manaia to collect Mr Mackay. The Tauranga arrives at Auckland with 600 oz retorted gold from the Shotover claim. It has been laboriously separated by only a hand stamp and small Berdan. Mr Kelly, whose reef has been hitherto unknown to fame, brings up 99 oz of gold by the Enterprise. The weather of the past fortnight has been anything but favourable for mining pursuits otherwise a much larger amount would have been sent up for export. There will however be fully 1,000 ozs, which, considering the poor facilities the miners at present possess, is most satisfactory. 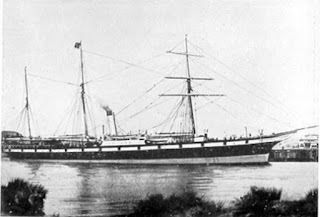 The gold will be shipped to Sydney by the mail steamer at the start of next month. In their tent on the Karaka Flat a digger named Gilmore is having a hard time with his mate, Thomas Munro. Thomas is a boatman employed by the shipping department of the Daily Southern Cross. Gilmore has been concerned about Thomas – since he came to Shortland Town he has been complaining of pain in his chest and tonight his mind seems to be wandering. Thomas is not a steady man but has not had a drink since Monday. Thomas has some medicine which his mate fetches for him. Thomas gives Gilmore his miner’s right, saying he will be searched the next day. Gilmore asks why and Thomas mysteriously replies he will find out. Salts, senna and a little camphor. On the Karaka Flat Gilmore is boiling the billy outside his tent when Thomas Munro comes out and tells him he is just going to the rear of the tent. Gilmore asks why, as breakfast is ready. Thomas is gone about 15 to 20 minutes when Gilmore becomes concerned and asks another mate, Richard Clifton, to go and look for him. Clifton finds Thomas drowned in a small creek about 200 yards from the tent and rushes back to tell Gilmore. Constable Wallace and Dr Clarence Hooper are sent for. There are some hundreds of tons of stone lying on the claims waiting for machinery. A spur bordering on Tararu Point is new ground – several claims have been pegged off there, giving employment to some of the more recent arrivals. A portion of Mr Goodall’s machinery has arrived from Coromandel by the cutter Wanderer and will be landed on the beach close to Moanataiari Creek. This being Sunday the Post Office is closed. Several men grumble having come from a distance to get their letters. It would be a great boon to those working on the ranges if the Post Office were opened for one hour at noon on Sunday’s, so as not to interfere with Divine Service. A reporter from the Gemini party at Kopu goes up to the Kirikiri settlement which is situated in a beautiful valley, the greater part of which is under cultivation. A good area of land has been recently ploughed. There is a dairy with an array of pitchers. Elsewhere he sees miles of fertile land covered with tall manuka and flax, looking dreary. 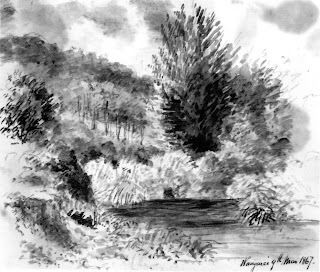 The Provincial Government have purchased and half purchased considerable blocks of land on this river and he thinks if our settlers could cultivate in confidence, there would surely be a rush to the valley of the Thames. About 35 acres at Kopu belong to Mr Whitaker, the best situation for a township about the entrance to the river. When the river is opened there can be no doubt that it will prove a most valuable property as it is the best landing place in the lower part of the river and is conveniently situated. An inquest on Thomas Munro is held at Shortland Hotel. After much conflicting evidence is given by his mates as to his character and habits, the jury proceeds to the creek where the body was found. Dr Hooper says he thinks the medicine Thomas was taking was salts and senna with a little camphor in it. The jury reaches a verdict of found drowned. The Sea Belle, heading for the Thames with four horses and several passengers from Tauranga, has to take shelter at Mercury Bay. Mapere for the Thames with 20 head of cattle, shipped at the Custom-house Street wharf. Alarm for the Thames with produce and cattle. Catherine, Cornstalk and Sydney for the Thames. The Tauranga returns to Auckland with the body of Thomas Munro. All the ships in harbour hoist their flags half mast out of respect to the deceased, who has been connected with the shipping reporter’s department of the Daily Southern Cross for many years. Thomas is interred in the Symonds Street cemetery this afternoon. Rangatira for the Thames with 3,000 bricks, 26 bushels lime, 600 ft boards, 2 passengers. Wahapu for the Thames with 7,000 bricks, 100 bushels lime. Frances for the Thames and Hot Springs with 1000 bricks, 4,000 ft timber and sundries. The Enterprise on her arrival back at Auckland is laid up for her usual quarterly inspection. During the time she is on the hard she will be fitted with a new cabin for ladies and receive many other improvements and alterations. The Gemini arrives back at Shortland Town from Manaia this afternoon with Mr Mackay and Te MoananuI. Shortly after they land it is rumoured that all the land extending from Kauaeranga to Cape Colville, to Mercury Bay on the east coast, and the interior will be proclaimed open to Europeans for gold mining. Mr Mackay rides over to Kopu to tell Superintendent Williamson that owing to the absence of Warden Baillie, it is impossible for Mr Mackay to go upriver in the steamer. They party nevertheless will start without delay for the Upper Thames on their quest to open it up for gold mining in the morning. *They were probably one day off - there is some inconsistency over James Cook’s birth date. It is usually recorded as 27 October 1728; others say the correct date is 7 November 1728. Cook was born in the period before the adoption of the Gregorian calendar in Great Britain and his date of birth by the Julian calendar was 27 October. In 1750, Britain passed the Calendar (New Style) Act and from 1752 transitioned to the Gregorian calendar. By the 18th century the difference between the Julian and Gregorian calendars was 11 days. The correct date of Captain Cook’s birth is believed to be 27 October 1728. Dr Clarence Hooper - Member Royal College of Surgeons, England, 1859 & Licentiate of the Royal College of Physicians in Edinburgh in 1861. Trained at St Bartholomew’s Hospital, London. Appointed assistant surgeon 1st regiment Waikato Militia in July 1863, promoted to surgeon in October 1863. Historia Nunc Vivat – Medical practitioners in NZ 1840 – 1930 – Rex Earl Wright – St Clair.